Pegasus Ventures distributes a complete selection of 2 part restaurant guest checks for customers across North America and beyond. Restaurant guest checks come in two forms, either loose on in books. 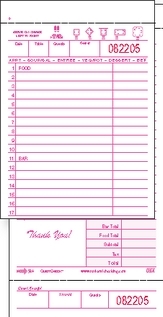 Need help deciding which guest checks to buy for your restaurant, catering business or food service operation? Click or tap now for a guide to understanding restaurant guest checks. National Checking Company, America's best known restaurant guest check brand. 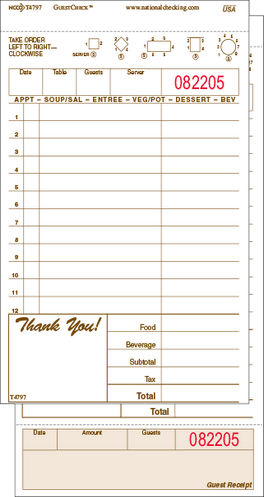 National Checking Company offers a wide variety of 2 part restaurant guest checks, in either loose or booked style. Pegasus Ventures now prints our own guest checks. The Pegasus Ventures brand guest checks adds to an extensive choice of restaurant checks buying 2 part guest checks for their restaurants. Orders for 2 part guest checks for your restaurant, catering business or food services operation received by noon Eastern time ship the same business day; all other orders ship the next business day. After ordering customers receive a confirmation email and as orders ship customer's receive an email alerting them to the tracking information and expected delivery date. 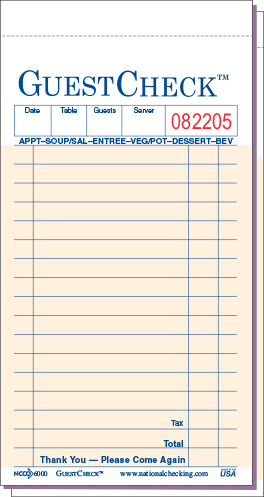 Carbon-less 2 part restaurant guest checks create a duplicate copy without needing a carbon insert. These checks from Pegasus Ventures Michigan and National Checking Company work perfect for any environment which requires duplicate check copies.